Crowdpac was started in Menlo Park by Steve Hilton, Gisel Kordestani, and Adam Bonica in 2013 as an experiment to help bring more Americans into the political process. They started a company in which a diverse and ideologically open group of students, engineers, designers, and political veterans worked to bring more people into the political process as voters, donors, or candidates. Crowdpac ultimately built a crowdfunding tool that became the fastest way for emerging leaders to raise their first political dollars. First-time candidates can now collect credit-card backed pledges of support to test the viability of their campaigns. Nearly 60% of our donors are giving for the first time. Roughly 44% of candidates on Crowdpac are running for the first time. 70+ of the candidates who crowdfunded on Crowdpac won their races in 2017. The Cook Political Report shifted 13 Congressional district ratings based on Crowdpac candidates demonstrating viability with our tools. 69% of our candidates are running for state or local office. 46% of our candidates are women. Just a couple of weeks ago, we saw nearly a dozen first-time candidates emerge from Oklahoma after the Teachers Strike. Be it Texas, Arkansas, or Utah — from school board to Senate — we’ve seen strong crowdfunding campaigns in places you wouldn’t expect. Though we are an open and non-partisan platform, a substantial portion of our community (including donors and campaigns) have been motivated by opposition to Donald Trump and his political movement. The irony isn’t lost on us that our first CEO, Steve Hilton — a conservative political strategist — helped start a platform that has become an element of the anti-Trump “resistance” movement. As a company started by founders of diverse ideologies, however, we understand that such political ironies are common. We have veterans of the Romney, Obama, and Clinton campaigns on the team. We have seen a lot, and we are united by our mission of bringing more people into the political process. Unfortunately, Steve’s profile as a political pundit on right-wing cable news has created a tension within our platform and community. Over the past couple of months, we’ve heard from many quarters of the Crowdpac community that, in light of Steve Hilton’s punditry, the use of our platform is seen as an endorsement of President Trump and his political movement. This isn’t even close to true, but it has created unnecessary drag for many of our users working to raise funds and build support for their campaigns on our platform. Our business has been built around removing friction from participation for leaders and candidates, and any perceived endorsement of Trumpism, true or not, could hinder our growth and their success. The truth is that the actions of President Trump and his movement run counter to our values and the values of the vast majority of our users. We believe that it should be easier for people to vote, not harder. President Trump and his allies are working to undermine the democratic process by putting barriers in the way of Americans they think might vote as Democrats. Voter ID laws, sham voter fraud commissions, and other proposed laws and policies designed to hinder participation run directly counter to the goals and mission of our business. Meanwhile, although both parties have been guilty of gerrymandering over time, the modern Republican Party has poisoned our politics through racial and partisan legislative boundaries — even as courts across the country strike their maps down. We pioneered the use of objective analysis of campaign spending to help voters assess political candidates. Donald Trump and his movement have elevated alternative facts, fake news, propaganda, the denial of scientific facts, and the obstruction of investigative norms to levels dangerous to the functioning of a liberal democracy. We’re proud of the diversity of our team and the incredibly diverse group of candidates, campaign creators, and donors that make up our community of users. Donald Trump and his movement have sadly weaponized and promulgated race-based hostilities against groups of people based on their ethnic heritage, religious belief, or national origin. It has become clear that our users, our community, and our company share values that Trumpism does not. Our community has already rejected Trumpism, moving forward, we’re rejecting it too. 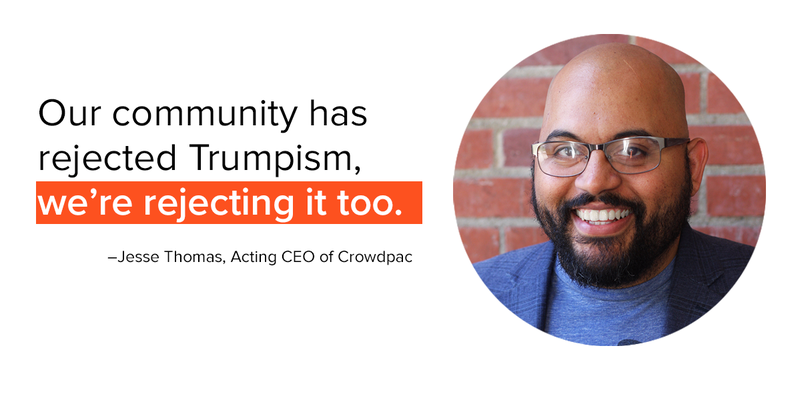 Because Trumpism is so heavily linked with the modern national Republican Party, and because very few federal leaders in the Republican Party have meaningfully rejected Trumpism, we are temporarily suspending fundraising for Republican candidates on Crowdpac.com. This decision has been a hard one for our company, but as Trumpism has spread through the Republican Party we’ve started to see an increase in campaigns for Republican candidates that we cannot allow on our platform. For example, Patrick Little is the top polling Republican candidate for US Senate in California. He is also an avowed Neo-Nazi comfortable enough in this new era of Trumpism to run for federal office under the banner of the party of Lincoln. His campaign tried to use our open and non-partisan platform to create a fundraising campaign that clearly violated our values as well as our anti-hate speech and anti-hate-group guidelines calling for donations that could help him remove “jews from power”. We find ourselves grappling every day with campaigns fueled by Trumpism that skirt the thinning lines between overt hate speech and the rhetoric and actions used to stir up racial animosity legitimized by the President of the United States. These campaigns and this activity run contrary to the values of our company and community. 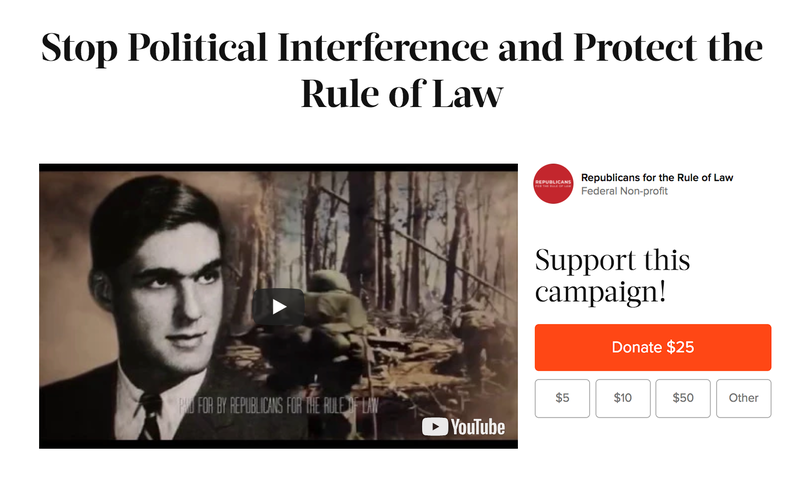 For that reason, over the next 10 days, we will be suspending any fundraising campaigns on our platform featuring Republican candidates as recipients until we can figure out how to systematically confirm that those campaigns and candidates align with the values of our community in a way that Trumpism does not. We hope that making this move will help our users feel confident that their activity on our platform is a rejection, not an endorsement, of Trumpism. We remain open for Democrats, independent, unaffiliated, Libertarian, Green, and other third party candidates to use our platform for change and actively encourage them to do so. Republican campaigns that clearly reflect the values of our community in support of organizations such as this one will also remain live on our platform and accepted on a case by case basis. Steve Hilton is also stepping down as CEO of Crowdpac, handing the permanent position to our co-founder and COO Gisel Kordestani, who is currently out on maternity leave. I’ll be steering this transition as Acting CEO of Crowdpac through the November election, and I’m looking forward to it. I have quite a bit of experience bringing people into the political process through creating products that have helped millions of people register to vote, get to the polls, run for office, or support the causes and candidates that they care about. In my previous role as Crowdpac’s VP of Product, I’ve happily watched as the tools we’ve built have found a market that values them. I’m now delighted to announce that we are doubling down on our commitment to the values of that market. There is a wave of democratic participation sweeping the nation right now. In my view, Crowdpac’s role is to bring as many people as possible into that wave. Our tools present the fastest way for new leaders to raise their first political dollars for change. Whether you’re a candidate, activist, organizer, looking to put up a billboard, fund a TV ad, create a slate of causes to support, or do some quick and free joint fundraising, our job is to make it as easy as possible for you to bring along as many people as you can into the coming wave of democracy. Democracy is our business, and we think it’ll be a great year. I invite you to crowdfund your next cause or campaign on Crowdpac — it only takes a few minutes to get up and running. Crowdpac is the best way to raise money for a campaign online. www.Crowdpac.com — Your platform for political action.